All Jackpots Casino was founded in 2003 and is a member of the highly recommended group of casinos owned by Jackpot Factory. Being powered under the Microgaming brand of online casino games and licensed by the Kahnawake Gaming Commission in Canada has solidified their stability in the gaming industry. All Jackpots Casino and its sister sites are also approved of by GamCare, which is a player protection watchdog that credits online casinos for demonstrating high standards of customer care. The owners of this casino have given great care to the reputation of their casinos and offer only the best in online gaming entertainment. 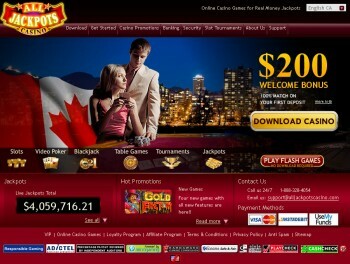 Some of the best reasons found for becoming a player at Jackpots Casino centers around the fantastic games offered. All Jackpots Casino has over 500 state of the art casino games available to enjoy on each and every visit. Slots are one of the biggest draws to All Jackpots Casino because of the fabulous reputation that Microgaming Viper software has brought to the industry. These slot games rival any Las Vegas slot machine for fun, excitement and coin prizes with jackpots hit often and easily. Table games are numerous with a wide variety of poker games in different styles, variations and betting limits. Roulette and Craps, crowd favorites are of course front and center in the casino with both versions of Roulette, American & European both available to play. Video poker has a huge following at All Jackpots Casino because with over 50 different games to play its one of the longest list of video poker choices available at any online casino. Graphics and audio are superb and game play is fast, easy and fun. All Jackpots Casino has a great welcome bonus program offered which gives new players a 100% match bonus on your first deposit worth up to $200. Once you’re a new player at the casino you are also offered a 10% cashback reward where every single month you can claim up to $350 in cash back rewards! New games are always introduced at Microgaming casinos with at least 3 or 4 games every quarter. Special promotions, events and tournaments are a source of great anticipation for All Jackpots Casino players because the prizes and bonuses are always outstanding. Telephone – Eight different phone numbers are available via their website under the tab “support” including numbers for UK, Canada, Australia, Germany, Italy, Spain, Netherlands and the Rest of the World.